Tarso Marques drove for Minardi during three separate seasons but never completed a full championship. He made his debut in 1996 but only competed in two races as the team rotated its drivers depending on who could pay the most. He competed in 10 more grand prix in 1997, although poor reliability meant he struggled to set himself apart from his competitors. 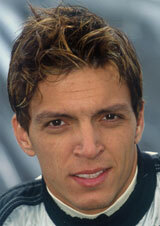 In 1999 he moved to Champ Cars for two years, where he again struggled to shine. In 2001 he got another crack at F1 and partnered Fernando Alonso at Minardi in its first season under Paul Stoddart's ownership. He was replaced by Alex Yoong with three races to go, but owing to his better race finishes (neither scored any points), he actually finished ahead of Alonso in the final standings. He returned to Champ Car for the occasional race between 2004 and 2005 but eventually ended up racing for his own team in the Brazilian V8 series.